Here we are, a couple of weeks after the highs off a great DEXA. Some really positive fat loss results and muscle retention, now back to the normal day to day grind of the workout and life. It’s a bit hard sometimes to keep focus and on the straight and narrow. After a lot of highs, come the inevitable lows I guess. It will probably come as no surprise to people reading this that I am a man of extremes, especially when it comes to mental health, massive highs and very crippling lows. The highs are great, energy everywhere and feeling like conquering the world, bulletproof if you will. The lows on the other hand are quite the opposite, days on end of listlessness, fatigue, self-absorption and a general lack of interest in anything other then the couch and bed. This little escapade with Steve and the guys has taught me a lot about my mental side and how exercise can help. There has been dark days along the 25 week ride, days when normally I would have curled up on the couch, shut the world out and taken a mental health day as I used to call them. But the purpose that the program has given me has slowly bit by bit helped me. It probably seems from these updates that it has been all joy and roses, but not all the way. There has been a few wobbles and definitely days that I’d rather not have trained but through the support, camaraderie and just genuineness of the entire team, we are making huge strides. On a few occasions, tired and a bit emotional I’ve thought about ditching the days workout. Great excuses come into the mind, “it’s too much”, “you can double the workout tomorrow”, “you need the rest”, or “you might injure yourself” are some that spring to mind. All seem like great ideas at the time but the only thing they are/were, are excuses. I mentioned this to Matt a few weeks back and he said to me, “the only workout you regret doing is the one you don’t do“. Oh how right he was, the absolute guilt and torture I would put myself through for not going was immense and I realised that for me, just getting some kind of workout done be it bad or good, was much better than not doing a workout at all. I guess with this update, I’m just hoping to make everyone aware that there are ups and downs with all parts of life, to take heart in the small victories and solace in the fact that it’s a bumpy ride all round but one with light at the end of the tunnel always. The road is long, full of turns and it’s easy to lose your way, but keep plugging away. If anyone is thinking it’s all too hard to start a weight loss program or set some fitness goals, have a look at the previously obese, depressed, beer monster here. If I can get my house in order with the help of the team, believe me, anyone can!!! 'I guess like any story like mine, I wasn’t always weighing in at 128kg. As a kid up until about the age of 22 or so I was an extremely active fit fella, played huge amounts of our national sport (hurling, gaelic football, YouTube hurling, it won’t disappoint you! ), soccer and sprinting. Once Uni finished and work kicked in, we saw a steady incline in weight and the start of a lot of yo-yo in dieting and weight changes. I was initially approached by my workplace to meet with The Fit Lab regarding something other than fitness, and during my research for that and during my meeting with Chris and Tammy, I was really taken by the business, its goals, the facilities and just the general feel of the facility. I approached The fit Lab with my situation and the idea of tracking the story and the rest is history. What struck me about the program was the grounding in actual science and the commitment to a sustainable program that is also life changing. Steve Nance is a big motivator too, when do you get a chance to train under a man with such a fantastic CV of Strength and Conditioning coaching at the highest level?? The whole thing about measurements, DEXA scans, publishing in print and social media is confronting at first, but I feel now it’s critical. The Fit Lab is doing great things. There is a genuine feeling that the business as a whole wants to help make massive life changes for people. If by publishing this journey we help motivate others to make better choices, then we have achieved our aim. The staff at QLD X-Ray were magnificent, so helpful and really made the process (which was a bit scary to be honest) really fun and so informative. That process and the explanation of the results, really helped with focusing and educating me on the fact that the scales are not the be all and end all of this process. I’m really looking forward to the program, in a few days when I’m cranky, sore and tired, I will hate everyone, but that’s allowed!! (only joking) I like structure, and the program gives me that, something to work towards and to commit to. Overall, I’m really excited to start. I fully understand that it’s not going to be easy, but nothing worth while ever is. We are so excited to be a part of Kevin's '25kg in 25 weeks' FITNESS ADVENTURE!!! There are so many people out there, i am sure, that can relate to Kevin's story..
Be sure to stay updated on Kevin's journey. We will be posting every fortnight with how he is progressing.. So, I’m 3 weeks into this program, and surprise, surprise, I’m enjoying it! As with everything, the start was hard, more so getting into a routine of exercise. Now, I’m actually looking forward to my workouts!! The staff are really helpful and supportive, always giving advice, positive support and answering my inane silly questions! The workouts are interesting and bring out a real competitive edge. I find myself trying to beat my last performance. The dietary side of things, which I though was going to be a real drama, isn’t. Just a small bit of planning and plenty of water is all it takes. I am 3 weeks in and i am 6 kilos down on my starting weight!! I’m actually feeling much better about myself in general. Sleeping better, my mind is clear, i have a lot more energy and i am a lot more focused. To be honest, the key to all of this is listen! Listen to what the staff from The Fit Lab advise. Follow it and results will follow. That’s not a plug by any means, but just my honest assessment after the first 3 weeks. Corey, Steve, Matt and Zac really know their stuff and they are more than willing to help. If there is any advice I can give to others in a similar situation to mine is DO something, start now.. That will be the hardest part, making that first move! The team at The Fit Lab will make a difference to your lifestyle and health, I am proof of that already.. So it’s Christmas and what have you done?? Well, since we last updated, I’ve finished the first 5 week block of training and just started my next 5 week block. Training has become a bit more intensive with increased tempo and upping the weights lifted with less reps. I feel much stronger, much healthier and definitely feeling much fitter. Again, Corey and the team have been a great help explaining the updated program and helping me through it. It’s amazing, working out and going to the gym are now part of my routine, the non-negotiables of the day if you like. There is a great feeling of achievement and satisfaction when I get to tick another workout off the list. The dreaded Christmas period weighed heavy on me before hand, fear of over eating and being back at square one again had filled my mind at times. But, with a bit of thought, some self-discipline and some fire not to be defeated, it all went well. I enjoyed my Christmas, balanced out some indulgence in eating with keeping training going, I even got a session in on Christmas morning! We are progressing well weight wise, down 9-11 kgs, fitting into clothes much better and just a general good vibe. We still have a fair way to go, but it’s really enjoyable, it’s not easy, but so worth it. You become more attuned to treating yourself better food wise etc. as in putting in a lot of hard work in the gym is pointless if you are going to feed yourself junk, I think that is probably the biggest lesson I’ve learned so far. Looking forward to the next few weeks. As we say in Irish “ Tiocfaidh ar la!” Our day will come! If thou gaze long into an abyss, the abyss will also gaze into thee. So, here we are, 2 weeks into our second 5 week block. The training is great, Corey and the team are so knowledgeable and helpful, I just can’t get that across enough! I had a mini melt down over the past two weeks in regards to weight loss, it’s amazing the tricks your mind and emotions will play on you. With the first 6 weeks or so, we were dropping weight at the rate of knots. Lately for about a week or so, I didn’t lose weight at the same rate and panic ensued! Even though I was still dropping weight, getting stronger, feeling great and eating well; I was turning what was still great progress into something terrible, which it wasn’t. I even went as far as weighing myself 3-4 times a day! Sooo, while all this mental madness was going on, we managed to row for an hour covering just over 12kms, which I certainly couldn’t do 7 weeks ago! There was a huge mental block to actually doing something like that, like it was an insurmountable mountain that was for the other fit guys/girls and I wasn’t going to be able to do it. But, with a bit of 'devil may care' attitude and a 'let’s just give it a go' mindset, we got there. Now, I want to set more goals for myself; definitely want to complete a 20km row, get a 10km run in somewhere and climb to the top of Table Top in the next two weeks. I have signed up for Stadium Stomp at the Gabba in July, so that’s another one to work for as well. All of this would not have entered my mind if it wasn't for the help of The Fit Lab team. I have a much more positive attitude towards giving these challenges a go, which I most definitely didn’t have before I started the program. There is a lifestyle change happening, a change in mindset, give it a go people, you might surprise yourself……. So here we are, 4 weeks into the second five week block. Lets get a few measurements out first…. weight - down 14kg in 9 weeks and waist – down 14 cm in 9 weeks. After my mini melt down, it took a bit of stock to progress where I am now, compared to the start of the program. I had the cathartic shifting from the fat clothes to the slightly less fat clothes! I even managed to get into clothes I had not worn in 2-3 years; it might not be much to some people, but it means that I can both see and feel progress. Of course there are the days when I look at myself and don’t like what I see, but this is where you have to remind yourself that the weight didn’t come on overnight, nor will it come off overnight. The girls/guys at the The Fit Lab are so supportive. There are times when I am walking through the door full of doubt, tired and not sure if I feel like doing the days work out. But there is always a warm smile and an encouraging greeting at the front desk and on the floor, it goes a long way when you are a bit down. Not everyday is full of roses and happy, but, knowing that you are going to a positive place to do yourself good, is a massive help. I’ve had the pleasure of being allowed workout in the high performance centre a few times a week and its such a great place to see the other side of The Fit Lab in action. The athletes there are getting the best of training and it’s a fantastic environment for old fatboy here to workout in, although it does make me a bit nostalgic for the days of my youth when I felt I was unbreakable and could run forever!! But, we are making great strides with the teams help, dare I say it, I might even be a bit proud of myself (only a little mind!). 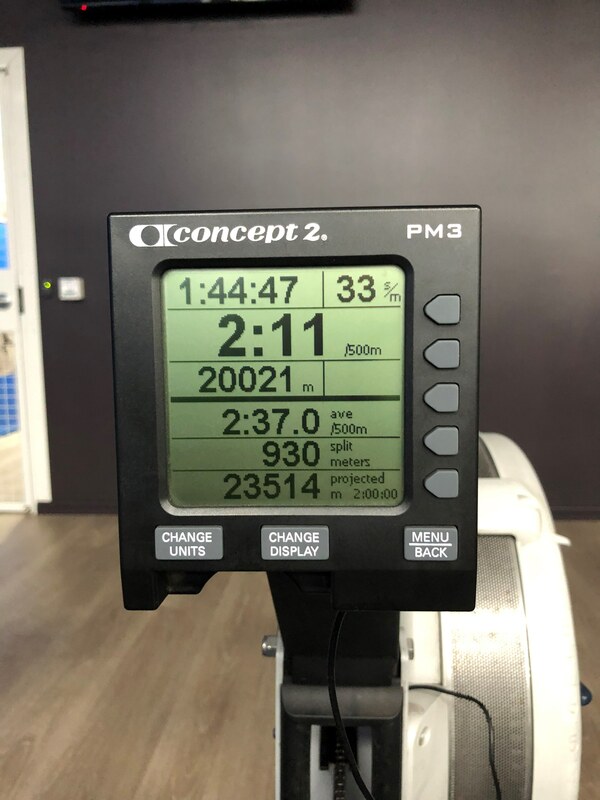 We set a few lofty goals in the last update, I’m glad to report that we got the 20km row out! Picture below to act as proof! We didn’t set any records for time, but we got through it and I must admit my posture wasn’t exactly right for a few days! I’ve started to run a bit and got 4km out in one go the past week (again, we wont be going to the Olympics!) but, it was a start along the road to 10km! I didn’t manage to get up Table Top in the last 2 weeks, but I promise faithfully I will provide photo evidence on the next update! Overall I am feeling stronger, happier, motivated, it works wonders to have a purpose and to see progress even if there is the odd dark day in there, the exercise and the encouragement from the team really help those harder, darker days. I am just a normal fella, with a normal job and a normal life, so many of you reading this are the same. I encourage anyone who is in my situation of 10 weeks ago (overweight, unhappy, unhealthy , depressed, directionless), get in contact with the team at The Fit Lab. The hardest step will be the first however, you will get results, you will feel better, you most definitely will work hard and there is a place for everyone of all shapes and sizes here. Do it people……it will be the best thing you will do for yourself……. You miss 100% of the shots you don’t take…. I made it!! Table top was beaten last Sunday morning. 30 mins up, 30 mins on top and 25 mins down. Again, no records broken, but I got there! Surprisingly enjoyable too! Very satisfying once completed (I will be doing this again and going for time now!!). 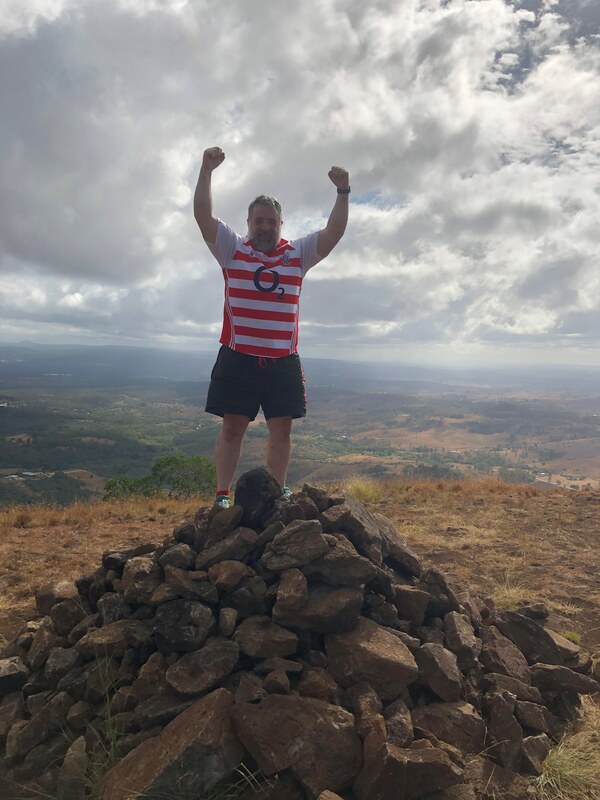 Now not to sound like an advertisement for the Darling Downs Tourism board, but how lucky are we to have this beautiful walk/climb 10 minutes drive from our doorstep! Sometimes with our busy lives we forget to appreciate the small stuff. Actually on that note, 11 weeks ago I wouldn’t have had the inclination or desire to have a go. This whole program has opened up a new world for me, getting up at 6am for a hill walk didn’t fit in with 20 pints on a Saturday night! There is a whole world out there that is shut off to you when you are overweight, unfit and lacking in energy; slowly but surely a veil gets lifted from your groggy mind. I also played my first game of football (soccer to you Aussies) on Friday night, over 35s of course. Now let’s be honest, Liverpool are not in any rush to sign up the burly skill less centre forward now playing for Wanderers, but again, I played the full match and didn’t make a complete idiot of myself! So, goals we set a few weeks back have been achieved, albeit for one, the dreaded 10km run, that one is coming too! I’ll keep you posted on that one. It will be a serious achievement. Something occurred to me whilst chatting with Steve the other day, The Fit Lab team are not miracle workers. Experts in their field, supreme in their support, guidance and advice, yes to all the previous but; there has to be a buy in from you too. The actual work has to be done by the participant, the team will help, but can’t make you do it or do it for you. If you want to change, want to get more from your life, live a bit fuller and longer, this is the team for you, but you have to want it yourself. Just a quick note on my jersey on Tabletop. It's my country jersey and I'm very proud of it. Only when I sent the pictures around did I realise I resembled 'Where's Wally!'. Not sure if I can ever look at it the same way again! Thanks Tammy lol!! Here we are 13 weeks in, 12 to go and just past the halfway mark. I began at 128kg and weighed in this morning at 111.2kg, so just under 17 kg shed!! Happy? Of course, but the dreaded mind starts to rumble at you. I got a bit over confident and decided a few nights on the beer was deserved; totally played havoc with weight, mindset and motivation. I tried to over compensate with putting the session at the gym I missed on a Saturday in on a Sunday, so effectively doubling up on one day. Yeah, not a great or intelligent move! I guess you live and learn, there is no room for over indulgence and a decent training regime. The all or nothing attitude that I’ve lived my life is slowly but surely changing, I guess one hiccup along the road is allowed? I am now 2 weeks into the next 10 week training block and the anti has been upped form Corey, Matt, Steve and the team. Now I must respond by are attacking it with vengeance; a bit of the hard word from Steve and friendly advice on lifestyle will do that to you! You would think at 42 I would know all this stuff, but you loose your way sometimes and the support of the team is invaluable. Of course there is the inner pride too not to let them down, or myself for that matter I guess. The time that the lads have invested in me is invaluable. I feel indebted to them and the gentle cajoling, support, expertise and indeed the odd deserved hard word is working wonders with a man who thought that being the jovial fat fella in the pub was my lot. Rome was most definitely not built in a day, the process is slow and not easy, but immensely satisfying. The spirits had dipped a bit but we are back now, not to be defeated and here to take on the last half of this challenge and hammer the goals….. In saying all that, Paddys Day is the 17th of March. Think I'll have to beg for special dispensation from Steve and the boys for the beers…..what you reckon???? What a couple of weeks that was! DEXA half way scan done plus a work training trip to Sydney for most of the past week; and not to mention being sent off (again) in football! Where to start?? Lets go with the really good news first ... DEXA!!!! Work had me in Sydney for some great training the past week and I realised something, Jesus I love Toowoomba and how lucky are we to live here? Sydney was great and busy, but just a bit too hard to get things done. Here in Toowoomba I’m a 5 minute drive from work, 2 minutes to The Fit Lab and a minute or so to the town centre. All this enables me to train basically when I want and not have it interfere with my work life. I managed to get 2 sessions in while I was down there so not a disaster, but I was deeply unhappy my routine was out of whack. It made me really appreciate what I have up here work-wise, play, gym etc. I guess it takes leaving for a small bit to make you miss things so, big praise for my adopted city and all it has to offer. I had a bit of a mishap at football last week (when I say mishap I mean twice in 3 weeks!!). In my youth I played huge amounts of team sports including football, hurling, soccer and rugby and I loved it. I forgot how competitive you get, how protective of your team mates you become and also how big a gob I have. Suffice to say refs don’t take kindly to being called certain names! Lesson to self .. inside voice Kevin, inside voice!!! I hate using this term but this “journey” is strange; ups, downs, good and bad, a massive amount of happiness and satisfaction with a bit of frustration thrown in. I’m learning an awful lot, both the factual about diet, exercise etc, but more so about myself and my drivers. I guess that’s all I have this week. The dreaded Paddy's Day is next week and I think Corey and Steve will be nice to me!! Oh before I go, Chris Hillman of The Fit Lab fame was generous enough to bring me along to the fight night at Rumours on Saturday. My first time ever, really enjoyed it and more importantly Toowoomba and The Fit Lab got a world champion! We have a world champion that trains out of The Fit Lab!!!! If that doesn’t motivate you or make you proud, I don’t know what will!!! !